Boiledbeans » Can we hold him responsible for obesity worldwide ? Can we hold him responsible for obesity worldwide ? Eugene polly. The guy who invented the tv remote control. Had to google the name. He’s the guy who invented the television remote control. Eugene Polley. Eugene Polley, credited for designing wireless remote controls for television. eugene polley – maker of remote control. 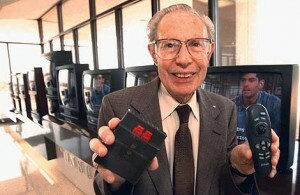 Eugene Polley, inventor of the TV wireless remote control, who passed away at 96. Damn. Never trust just one source. Polley invented the first wireless remote, but Adler is the guy in the pic.